New Puppies: After 3 days of use, puppies had reduced night disturbances of whining, scratching, and owner seeking. Adopted Shelter Dogs: After 28 days, Comfort Zone with D.A.P. diffuser was shown to improve a dog’s adaptability to a new house, reducing hiding, panting, and trembling, and urination and defecation. Noise Phobias: After 3-5 weeks, dogs exposed to loud noises had reduced signs of fear, including trembling, cowering, hiding, and panting. 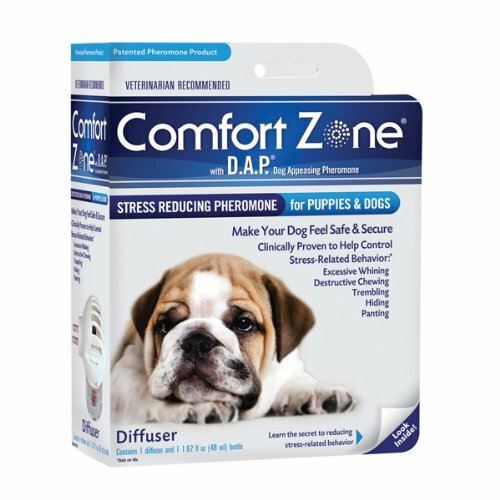 Travel: Comfort Zone with D.A.P Spray was shown to have a positive effect in as few as 1 car trips in relieving the apprehension of dogs during car trips, thus helping manage signs of car sickness. For best results, use behavior modification training along with Comfort Zone with D.A.P products.